Paatero, I., Alve, S., Gramolelli, S., Ivaska, J. and Ojala, P. M. (2018). 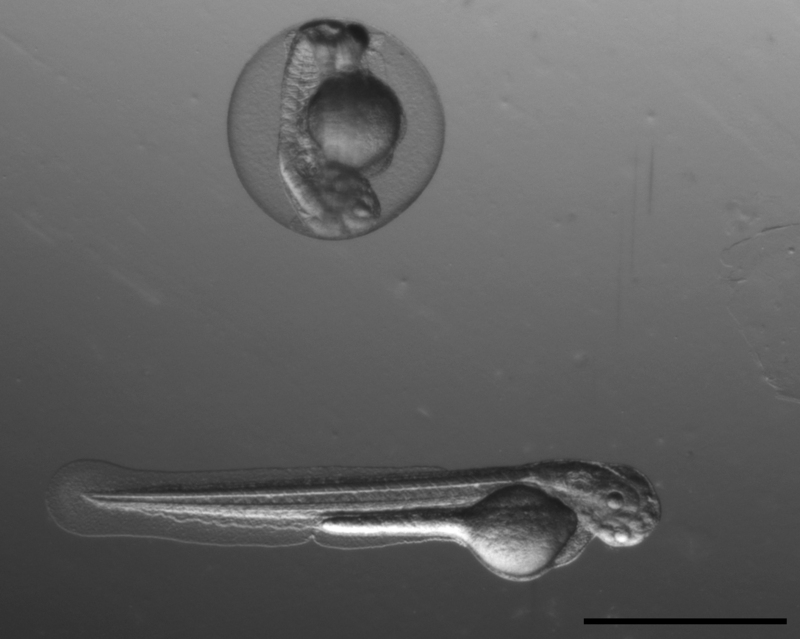 Zebrafish Embryo Xenograft and Metastasis Assay. Bio-protocol 8(18): e3027. DOI: 10.21769/BioProtoc.3027. Pekkonen, P., Alve, S., Balistreri, G., Gramolelli, S., Tatti-Bugaeva, O., Paatero, I., Niiranen, O., Tuohinto, K., Perala, N., Taiwo, A., Zinovkina, N., Repo, P., Icay, K., Ivaska, J., Saharinen, P., Hautaniemi, S., Lehti, K. and Ojala, P. M. (2018). Lymphatic endothelium stimulates melanoma metastasis and invasion via MMP14-dependent Notch3 and β1-integrin activation. 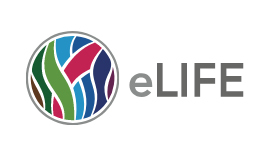 Elife 7: e32490. Xenograft models, and in particular the mouse xenograft model, where human cancer cells are transplanted into immunocompromised mice, have been used extensively in cancer studies. Although these models have contributed enormously to our understanding of cancer biology, the zebrafish xenograft model offers several advantages over the mouse model. Zebrafish embryos can be easily cultured in large quantities, are small and easy to handle, making it possible to use a high number of embryos for each experimental condition. Young embryos lack an efficient immune system. Therefore the injected cancer cells are not rejected, and the formation of primary tumors and micrometastases is rapid. Transparency of the embryos enables imaging of primary tumors and metastases in an intact and living embryo. Here we describe a method where GFP expressing tumor cells are injected into pericardial space of zebrafish embryos. At four days post-injection, the embryos are imaged and the formation of primary tumor and distant micrometastases are analyzed. Zebrafish (Danio rerio) is a small fresh water fish that has gained popularity as a model organism not only in developmental biology, but also increasingly in biomedicine. One of the rapidly growing fields, is the use of zebrafish as a model for cancer biology research. Zebrafish mate efficiently and reliably, and can produce lots of offspring that are small, transparent, develop externally and can be cultured easily in e.g., multi-well plates (White et al., 2013). Interestingly, human tumor cells can be implanted into zebrafish embryo and many of these xenografts are able to faithfully recapitulate their malignant behavior by growing, invading and metastasizing in the embryo (Lee et al., 2005; Nicoli et al., 2007; Chapman et al., 2014). Zebrafish has also become a highly tractable model system for molecular studies on vascular development, angiogenesis and lymphangiogenesis and helped us to improve our understanding of vascular disease in humans (Hogan and Schulte-Merker, 2017). The possibility to visualize both blood and lymphatic vasculature using live imaging techniques makes zebrafish suitable for investigating tumor cell dissemination and metastasis from the primary site (Hogan and Schulte-Merker, 2017). 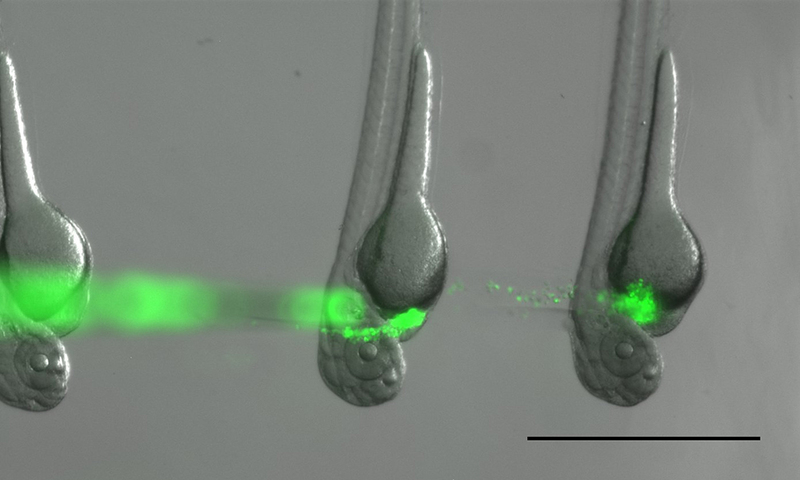 As compared to mouse xenografts, the zebrafish embryo xenograft experiments require lower costs, smaller numbers of tumor cells and are faster to carry out. Due to small size of the embryos, the transplantation needs to be performed using specific microinjection equipment. This consists of a fluorescence stereomicroscope, micromanipulator and a microinjector. Here, the xenotransplantation protocol is described using a GFP-expressing melanoma cell line WM852 (Pekkonen et al., 2018), but similar approaches can be used with a number of other cell lines (Veinotte et al., 2014). The use of cells labeled with a fluorescent protein is preferred, as this enables straight-forward quantitation of the tumor growth and direct detection of tumor cells in the embryos. Here, we have utilized mounting of the embryos inside agarose gel to allow precise transplantation of the cells into the pericardial cavity of the embryos. Other anatomical sites for injections such as yolk sac, perivitelline space, vasculature and hindbrain ventricle can be also used (Veinotte et al., 2014) and the choice of transplantation site depends on the experimental question and the used cell line. As the pericardial cavity is optically clear (in contrast to yolk sac), it enables a good view on the transplanted tumor cells, and the pericardial space is also easily accessible allowing reliable transplantation of tumor cells. Moreover, at the embryonic and larval stages used here, the pericardial cavity is not a site of prominent angiogenesis (in contrast to often used perivitelline space injections) and hence in this model, the cancer cells need to first invade locally before being able to reach the vascular network. Manufacturer: Honeywell, FlukaTM, catalog number: M0250-500G . Micropipette puller (NARISHIGE, catalog number: PB-7 ). Set-up mating two days before the injection day (Day 1). Three males and three females in a 3 L mating box are usually enough. Collect embryos in the morning around 10:00 AM (Day 0) (The zebrafish mate when the lights turn on). Select healthy fertilized embryos and place on separate 10 cm dishes–50 embryos/dish in 25 ml of 1x E3 + 0.2 mM PTU (see Recipes). Place in a 33 °C incubator (no CO2!!) (Day 0). On the injection day (Day 2), dissect the embryos out from the chorion membrane with fine sharp forceps (e.g., Dumont No. 5), if necessary. Many of the 2 dpf embryos may have hatched spontaneously (Figure 1). Figure 1. An unhatched embryo encased by chorion membrane (above) and a hatched embryo (below). Scale bar: 1 mm. Anesthetize the embryos with 200 mg/L Tricaine (MS-222, 4 g/L stock solution) (see Recipes) for 5 min. Melt aliquots of 0.7% low-melting point agarose (see Recipes) at 95 °C heating block. Let the block cool down to 37 °C before the next step. Note: Low-melting point agarose stays liquid at 37 °C. Add 53 μl of 4 g/L Tricaine-stock solution into 1 ml of 0.7% low-melting point agarose (final concentration of agarose is 0.66%). Vortex briefly, and spin down. Place the tube back to 37 °C. Prepare mounting slide. Take a normal glass microscopy slide and wipe it clean. Draw a bigger ellipse with a PAP-pen (for embryos) and a small circle (for 10 μl of cells) (Figure 2). Allow PAP-smear to dry for a couple of minutes. These hydrophobic linings will help to keep liquids in the correct place on the glass slide. Add 15 dechorionated and anesthetized embryos in the middle of the larger circle (Figure 3). Add 200 μl of low-melting-point agarose and align the embryos gently using a gentle orientation tool (e.g., a pipette tip with a bit of attached nylon line) (Figure 4). Figure 4. Aligned embryos inside the agarose on a microscope slide. Orientation tool made of two pipette tips and a nylon line is in the front. Allow the agarose to solidify. (The embryos stay alive within the agarose.) Store mounted embryos in a large (150 mm) humidified Petri dish (Figure 5), until ready to inject. Figure 5. A humidified Petri dish. 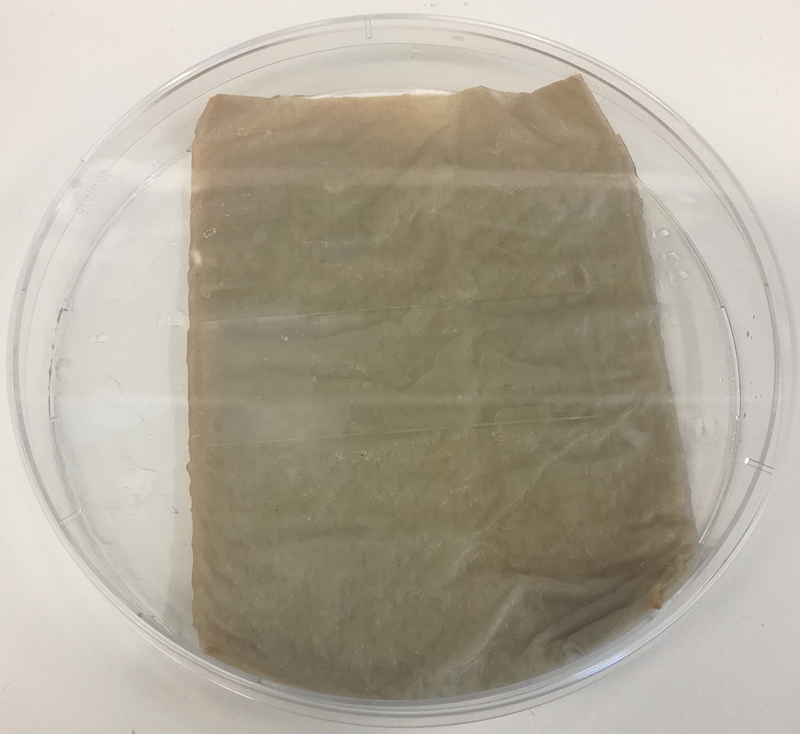 Wetted paper towel is placed on the bottom of the Petri dish and covered with a lid. To prevent drying, the microscope slides with mounted embryos are placed in this chamber. Use a 10 cm plate of GFP expressing tumor cells (50-90% confluent)/treatment. Wash cells 2 times with PBS. Aspirate PBS, add 3 ml of Trypsin-EDTA solution. Incubate for 5 min at 37 °C, or until cells have detached. Collect detached cells into a 15 ml Falcon tube and add 5 ml of DMEM + 10% FCS. Pellet cells (180 x g), 3 min and resuspend in 10 ml of PBS. Pellet cells (180 x g), 3 min and resuspend in 1 ml of PBS. Pipet the cell suspension into a FACS tube through a 40 μm mesh cap (BD Falcon). Pellet cells with a centrifuge for 3 min (180 x g). Count cell density (2 μl of cell suspension, 198 μl of PBS) using CEDEX XS cell counter. Dilute into a final concentration of 3-10 x 107 cells/ml. In 4 nl injection, this is 120-400 cells. Store cell suspensions on ice until ready to inject. Break a large enough opening so that cells can be easily expelled (> 25 μm, a larger tip helps to get more cells in embryo but generates more damage to the embryo and is harder to get through the skin of the embryo) (Video 1). Gently rotate the oil outwards, until all air bubbles are out and oil comes out from the tip of the needle (Video 2). Gently touch the side of the tip with a paper tissue to absorb the excess oil. Note: The glass capillary is extremely fragile! Add 10 μl of cell suspension in the smaller circle on the slide. Go to the injection work station. Move the needle into cell suspension and draw some cell suspension into the needle (Video 3). Monitor under a stereomicroscope that some liquid and cells actually go into the needle and it doesn’t get stuck. Next, inject the embryos (Video 4). Move the needle through the skin of the embryo. Try to hit an empty space around the heart (pericardial cavity). Expel a little bit of cell suspension into the cavity (one fine notch with CellTram). Look that some cells actually went into the embryo and then move the needle out (Figure 7). Figure 7. Embryos right after injection with GFP labeled tumor cells. Often some tumor cells escape from the injection site when the needle is withdrawn. Scale bar: 1 mm. Move to the next embryo. Continue until all embryos are injected. In one session easily > 50 embryos can be injected. After injections, discard the needle carefully according to your institutional guidelines. Break the gel using fine forceps (Video 5) and by flushing the gel pieces into a dish with 1x E3-medium (Video 6) (see Recipes). Pipette up and down with a large bore Pasteur pipette to release the embryos from the gel (Video 7). Move the released embryos to a new Petri dish with fresh 1x E3 + 0.2 mM PTU (see Recipes). Add antibiotics (1:100 Pen-strep) and incubate 50 embryos/dish at 33 °C until transplanted embryos are selected for the experiment. Culturing the embryos at a higher temperature (33 °C) than usually (28.5 °C) facilitates the growth of human tumor cells in this model. Without a separate animal experiment license, the experiment has to be ended at latest when the embryos are 5 days old !!! Consult your Animal Experiment Board for details. At 1-day post-injection (1 dpi) anesthetize embryos with 200 mg/L Tricaine and select successfully transplanted and healthy embryos (Figure 8) under a stereomicroscope into the experiment. Figure 8. A healthy transplanted embryo. Scale bar: 1 mm. Figure 9. Timeline of the experiment and examples of the results. A. Time line of zebrafish xenograft experiments. B. Intravital fluorescence microscopy images of six dpf zebrafish embryos taken four days post injection (4 dpi). Fluorescence in GFP channel is shown. Scale bar, 500 µm. Inset shows magnification of the primary tumor. Tumor cells invading outside pericardial space are marked with an arrow, invading cells in the pericardial cavity with a triangle and unspecific fluorescence in eye and yolk sac with an asterisk (*). The outline of the pericardial cavity is depicted with dashed line. Figure and text reproduced and modified from Pekkonen et al. (2018). In the image analyses, use ImageJ/FIJI software. Subtract background (subtract background > rolling ball radius 25) in the GFP channel. Outline the primary tumor area using a segmented line tool. Measure fluorescence intensity and shape (circularity) of the primary tumor. Count manually the cells that have invaded outside the pericardial cavity. Adjust contrast/brightness so that you can see individual cells. These are much dimmer than the bright primary tumor. Note: Autofluorescence is often observed in the lens and in the yolk. For statistical analyses, use GraphPad Prism 6.0 software (other statistical software is ok too). Perform non-parametric Mann-Whitney (2 groups) or Kruskal-Wallis test (for > 2 groups). For examples of the results, please see Figure 9b above and more detailed in Figure 7 in (Pekkonen et al., 2018). For handling the embryos, a glass Pasteur pipette with a pipette pump works the best. The tip needs to be expanded by cutting it with a glass cutter for safe transport of embryos. Also, plastic Pasteur pipettes can be used. Phenylthiourea (PTU) can be used to prevent pigmentation in non-albino zebrafish strains. PTU is neurotoxic  wear gloves and handle stock solution in chemical hood! Xenograft assay also works with many other, but not all, cell types, melanoma cell line WM852 is used here as an example. Sometimes the size of the implanted tumors may vary, if this turns out to be a problem, the relative tumor growth can be calculated and the number of invading cells normalized to the size of the primary tumor. Due to technical and biological variability, a fairly large number of embryos (> 25) need to be xenografted and analyzed to gain robust results. This can be achieved by combining data from multiple independent experiments. If one desires to implant a very large number of embryos (> 200/day), it is recommended to perform the experiment working as a pair. One researcher injects the embryos and the other one mounts and dismounts the xenografted embryos. Embryos are fragile and can break easily. Avoid forceful handling and touching of embryos with sharp objects (other than the capillary needle). Capillary needle is extremely sharp and filled with cancer cells. Caution is required so that the researcher doesn’t inject him/herself. During low-resolution imaging with stereomicroscope, the mounting of anesthetized embryos is not necessary. 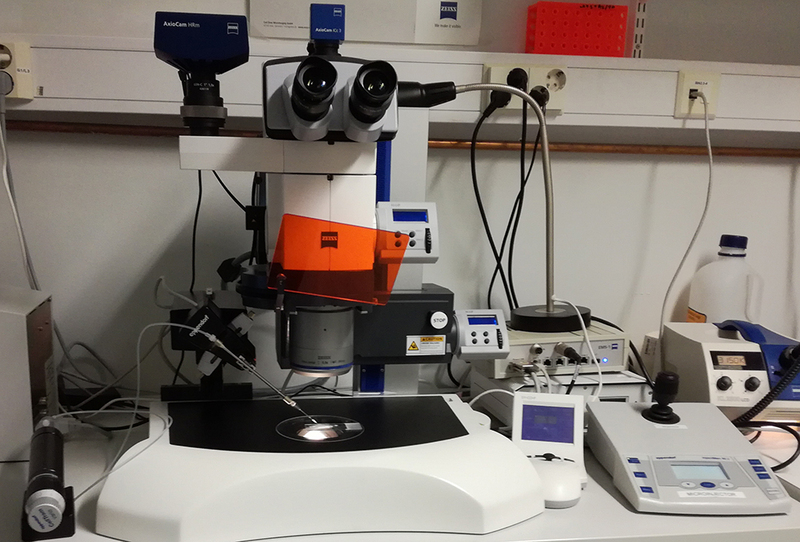 If one desires to perform higher resolution imaging e.g., using confocal microscope, the mounting of embryos using low-melting point agarose on glass-bottom dishes is required. Note: This solution is toxic, store in an air-tight bottle. This work was supported by the Centre of Excellence grant from the Academy of Finland (Translational Cancer Biology grant 307366; P.M.O., J.I. ), Finnish Cancer Foundations (P.M.O. ), Sigrid Juselius Foundation (P.M.O. ), S.A. was supported by the Doctoral Program in Biomedicine (DPBM; University of Helsinki), and S.G. by the Academy of Finland grant 309544. The Zebrafish Core and Cell Imaging Core (Turku Centre for Biotechnology, University of Turku and Åbo Akademi University) are acknowledged. These procedures have been evolved from the number of earlier work dealing with zebrafish embryo xenografting (Lee et al., 2005; Nicoli et al., 2007; Teng et al., 2013; White et al., 2013; Chapman et al., 2014; Veinotte et al., 2014; Xie et al., 2015; Yen et al., 2014). Experimentation with zebrafish was performed under license ESAVI/9339/04.10.07/2016 issued by national Animal Experimentation Board (Regional State Administrative Agency for Southern Finland). Chapman, A., Fernandez del Ama, L., Ferguson, J., Kamarashev, J., Wellbrock, C. and Hurlstone, A. (2014). Heterogeneous tumor subpopulations cooperate to drive invasion. Cell Rep 8(3): 688-695. Hogan, B. M. and Schulte-Merker, S. (2017). How to plumb a Pisces: Understanding vascular development and disease using zebrafish embryos. Dev Cell 42(6): 567-583. Lee, L. M., Seftor, E. A., Bonde, G., Cornell, R. A. and Hendrix, M. J. (2005). The fate of human malignant melanoma cells transplanted into zebrafish embryos: assessment of migration and cell division in the absence of tumor formation. Dev Dyn 233(4): 1560-1570. Nicoli, S., Ribatti, D., Cotelli, F. and Presta, M. (2007). Mammalian tumor xenografts induce neovascularization in zebrafish embryos. Cancer Res 67(7): 2927-2931. Nüsslein-Volhard, C., Dahm, R., Gilmour, D., Brand, M., Granato, M., Schulte-Merker, S., Schilling, T., Kane, D. a, Kishimoto, Y., Jessen, J. R. et al. (2002). Zebrafish: A practical approach. Oxford University Press, New York. Teng, Y., Xie, X., Walker, S., White, D. T., Mumm, J. S. and Cowell, J. K. (2013). Evaluating human cancer cell metastasis in zebrafish. BMC Cancer 13: 453. Veinotte, C. J., Dellaire, G. and Berman, J. N. (2014). Hooking the big one: the potential of zebrafish xenotransplantation to reform cancer drug screening in the genomic era. Dis Model Mech 7(7): 745-754. White, R., Rose, K. and Zon, L. (2013). Zebrafish cancer: the state of the art and the path forward. Nat Rev Cancer 13(9): 624-636. Xie, X., Ross, J. L., Cowell, J. K. and Teng, Y. (2015). The promise of zebrafish as a chemical screening tool in cancer therapy. Future Med Chem 7(11): 1395-1405. Yen, J., White, R. M. and Stemple, D. L. (2014). Zebrafish models of cancer: progress and future challenges. Curr Opin Genet Dev 24: 38-45. Copyright Paatero et al. This article is distributed under the terms of the Creative Commons Attribution License (CC BY 4.0). I have had also some troubles when transplanting into perivitelline space, and in most experiments I use other anatomical sites. For me it works best, if I inject into perivitelline space from posterior side and proximal to the body. So, approach the perivitelline space from tail side of the embryo, quite close to body and try not to extend the needle too deep in as it goes easily inside yolk. Having the needle coming in at a lower angle can also help. I wish that you find these tips useful.